In 1936 the King of England, George V died and Edward VIII succeeded him as King and jumped on the throne. ‘God save the King’ – halleluja! 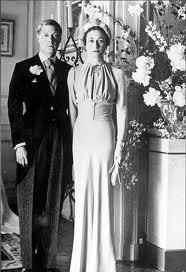 However, poor King Edward VIII had already fallen head over heels with the saucy divorced American, Wallis Simpson. The Royal family were really, really, really, really angry, yes,they were outraged, and they demanded that The King break up with Wallis Simpson. The King was a total sucker for love and in the end he broke up with the Royal Family. He gave up his right to the throne and went to France to tie the knot. They stayed together until Edward died in 1972. So, is love more important than duty? Posted on Sep 20, 2017 Sep 20, 2017 by Inglés MálagaPosted in Reading, VocabularyTagged aprende ingles malaga, b2, c1, phrasal verbs.